Sequential Circuits Inc. Model 700 Programmer and Model 800 Digital Sequencer from page 5 of Contemporary Keyboard December 1977. What an interesting ad to start 2010 off with! 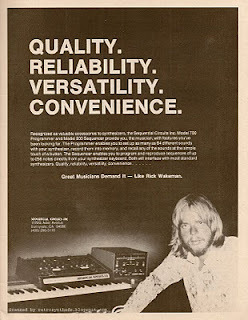 The first reason I find this add interesting is the fact that Rick Wakeman makes an appearance. If you are familiar with other SCI ads you may have noticed that musician endorsements were not a common occurrence for SCI around this time period. The only other Model 700/800 ad to date, from six months earlier, didn't drop any names at all. Maybe SCI was testing the musician-endorsement waters since other synthesizer companies like ARP and Oberheim were actively using musicians to promote their gear around the same time. Or, perhaps they purposely decided to stop using musician endorsements after this ad ran for some reason - maybe the costs were too high? Either way, its still interesting to me to see Mr. Wakeman in this ad. The second reason this ad is interesting is that it helps pin down the timeline of Sequential Circuits' ever-evolving logo and company name. The Model 800 sequencer in this ad has the newer 'Sequential Circuits Co.' logo in the bottom right-hand corner of the unit, unlike the Model 800 in the 700/800 ad just six months previous that included the older SCI logo. You can read a bit more about the SCI logo evolution in that earlier 700/800 advertisement blog post. The contact information in the ad also provides more information on the evolutionary time line of the company name. In this ad, the contact address used is 'Sequential Circuits Inc.' and the location given is at 1172G Aster Avenue in Sunnyvale, CA. The ad from only six months previous used 'Sequential Circuits Co.' located at 1016 Morse #13 in Sunnyvale. Even the phone number had changed. Looking at SCI gear production timelines, this change in address roughly aligns to when SCI probably had to expand a bit when they started building and promoting the Prophet synthesizer in late 1979/early 1980. Using Google Maps, I tried to get an idea on building size, but so much time has gone by, I'm not sure this is a valid comparison what so ever. So, did the expansion of Sequential Circuits into the production of the Prophet have something to do with the name change of the company itself from Co. to Inc.? And why didn't the logo text on the gear change to Inc. as well at this time? If anyone knows, please comment. Otherwise I plan to do a bit more research into this - hopefully before the spring.